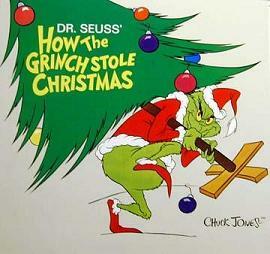 How The Grinch Stole Christmas first aired as a half-hour CBS television animated Special on December 18, 1966. It was adapted from the Dr. Seuss classic by legendary cartoon animator Chuck Jones (1912-2002), who also directed the movie. Boris Karloff lends his charismatic voice to the project, narrating the entire movie, including the voice of the Grinch. While faithful to the plot of the original story, several elements were added to the movie, including its songs. Perhaps the most famous of which is "You're a Mean One, Mister Grinch," which was sung by Thurl Ravenscroft, he who provided the ringing bass voice of Tony the Tiger on many a Kellogg's cereal commercial. The Grinch is a hermit who lives in a mountain cave near the village of Whoville. He is bothered and upset by all of the noise and hubbub he hears from the inhabitants of Whoville during the Christmas season and plots to steal all of the townsfolk's presents, thus robbing them of their Christmas. 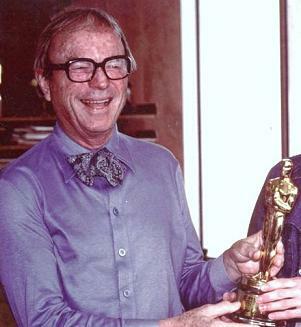 Deservedly a classic, shown quite a number of times during the weeks leading up to Christmas every year, it was but another in a long string of triumphs for animator Chuck Jones (1976 photo at left by Alan Light), who, during his long career, was nominated for an Oscar eight times for his outstanding work in animation, winning three. Jones' final Road Runner cartoon, "Chariots of Fire," came in 1994. Actor Robin Williams called him "the Orson Welles of cartoons." And it's hard to imagine anyone other than Boris Karloff narrating this classic Christmas fantasy any better. We hope you enjoy. As a perfect complement to the above, and in keeping with the theme of the Grinch, we proudly present the following updated version of "Grandma Got Runover by a Reindeer." I think a little humor is a fitting way to kick off the upcoming season of giving and goodwill. Happy holidays, everyone! Please note that there is one word that may not be suitable for younger listeners. Parents, be warned.